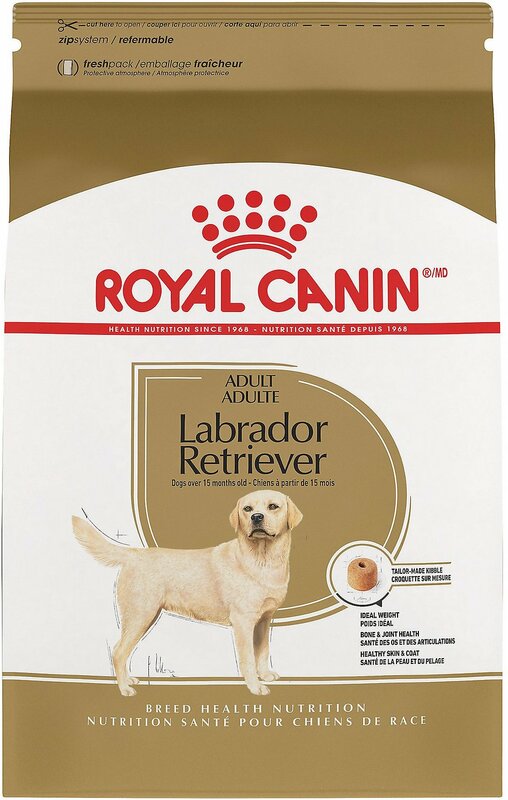 This Royal Canin formula is designed exclusively for pure breed Labrador Retrievers over 15 months. Labrador Retrievers typically eat very quickly and gulp their food. They also tend to gain weight, which puts more stress on their joints. The Labrador Retriever also has a waterproof coat, which means their skin secretes an oil that protects it against cold and water. That's why it's important to feed a diet that's tailor-made for all of their specific needs. Specifically formulated for pure breed Labrador Retrievers over the age of 15 months. It helps your pup maintain their ideal weight by providing an appropriate calorie content to keep them satisfied. Enriched with EPA and DHA to help support healthy joints and strong bones. Exclusive complex of nutrients, like fish oil, help maintain skin and coat health. Unique donut-shaped kibble helps to slow down the rate of ingestion. It encourages your pup to chew their food more and eases digestion. New Formulation: Chicken By-Product Meal, Brown Rice, Oat Groats, Corn Gluten Meal, Brewers Rice, Natural Flavors, Chicken Fat, Pork Meal, Dried Plain Beet Pulp, Powdered Cellulose, Wheat Gluten, Fish Oil, Vegetable Oil, Sodium Silico Aluminate, Calcium Carbonate, Potassium Chloride, Psyllium Seed Husk, Fructooligosaccharides, Sodium Tripolyphosphate, Salt, Taurine, Vitamins [Dl-Alpha Tocopherol Acetate (Source Of Vitamin E), L-Ascorbyl-2-Polyphosphate (Source Of Vitamin C), Biotin, Niacin Supplement, D-Calcium Pantothenate, Riboflavin Supplement, Pyridoxine Hydrochloride (Vitamin B6), Vitamin A Acetate, Thiamine Mononitrate (Vitamin B1), Folic Acid, Vitamin B12 Supplement, Vitamin D3 Supplement, Menadione Sodium Bisulfite Complex], Trace Minerals [Zinc Proteinate, Ferrous Sulfate, Manganous Oxide, Sodium Selenite, Calcium Iodate], Glucosamine Hydrochloride, Choline Chloride, Gla Safflower Oil, Marigold Extract (Tagetes Erecta L.), L-Carnitine, Green Tea Extract, Monocalcium Phosphate, Chondroitin Sulfate, Rosemary Extract, Preserved With Mixed Tocopherols And Citric Acid. Old Formulation: Chicken By-Product Meal, Corn Gluten Meal, Brown Rice, Oat Groats, Brewers Rice, Barley, Natural Flavors, Chicken Fat, Dried Plain Beet Pulp, Pea Fiber, Wheat Gluten, Pork Meal, Fish Oil, Vegetable Oil, Sodium Silicoaluminate, Calcium Carbonate, Potassium Chloride, Psyllium Seed Husk, Salt, Sodium Tripolyphosphate, Taurine, Fructooligosaccharides, Vitamins [Dl-Alpha Tocopherol Acetate (Source of Vitamin E), Inositol, Niacin Supplement,L-Ascorbyl-2-Polyphosphate (Source of Vitamin C), D-Calcium Pantothenate, Biotin, Pyridoxine Hydrochloride(Vitamin B6), Riboflavin Supplement, Thiamine Mononitrate (Vitamin B1), Vitamin A Acetate, Folic Acid, Vitamin B12Supplement, Vitamin D3 Supplement], L-Lysine, Choline Chloride, Glucosamine Hydrochloride, Trace Minerals [Zincproteinate, Zinc Oxide, Ferrous Sulfate, Manganese Proteinate, Manganous Oxide, Copper Sulfate, Calcium Iodate, Sodium Selenite, Copper Proteinate], L-Carnitine, Marigold Extract (Tagetes Erecta L.), Tea, Chondroitin Sulfate, Rosemary Extract, Preserved with Mixed Tocopherols and Citric Acid. This is only a guide. Optimal feeding amounts may vary according to your dog's temperament, activity level and environment. If you have any questions regarding your pet's health, please contact your veterinarian. Face and Jaw: All dogs fall into two basic jaw types: Brachycephalic or mesocephalic. Breeds with short, broad muzzles (like Bulldogs) are examples of a brachycephalic jaw. Breeds with a longer muzzle (like Labrador Retrievers) are examples of mesocephalic breeds. The jaw type, and even biting patterns can affect how a breed picks up kibble. Skin Types: The skin's most important function is to serve as a barrier of protection-but not all breeds have the same skin type. From wrinkled and folded (which traps heat and moisture) to sensitive or water resistant, precise levels of key nutrients help to support a breed's unique skin health needs. Distinctive Coats: There's more to a coat than meets the eye. 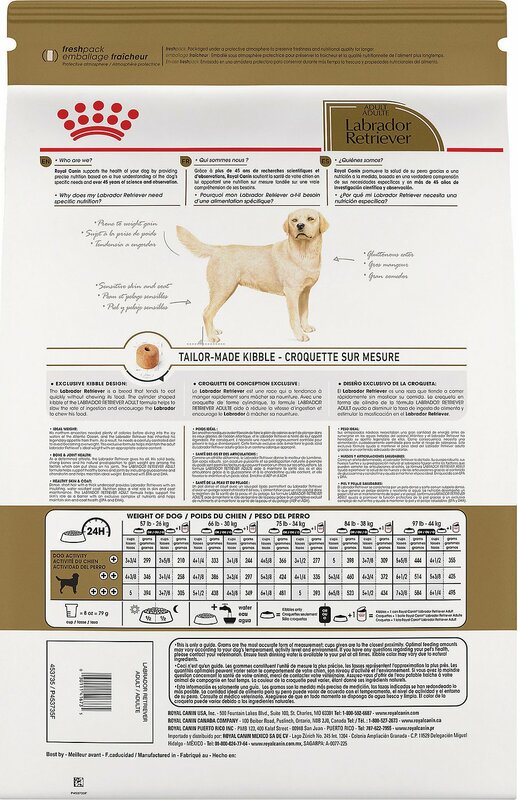 From the color and texture to undercoats, each pure breed dog has a unique coat with unique needs. Every dog is unique. 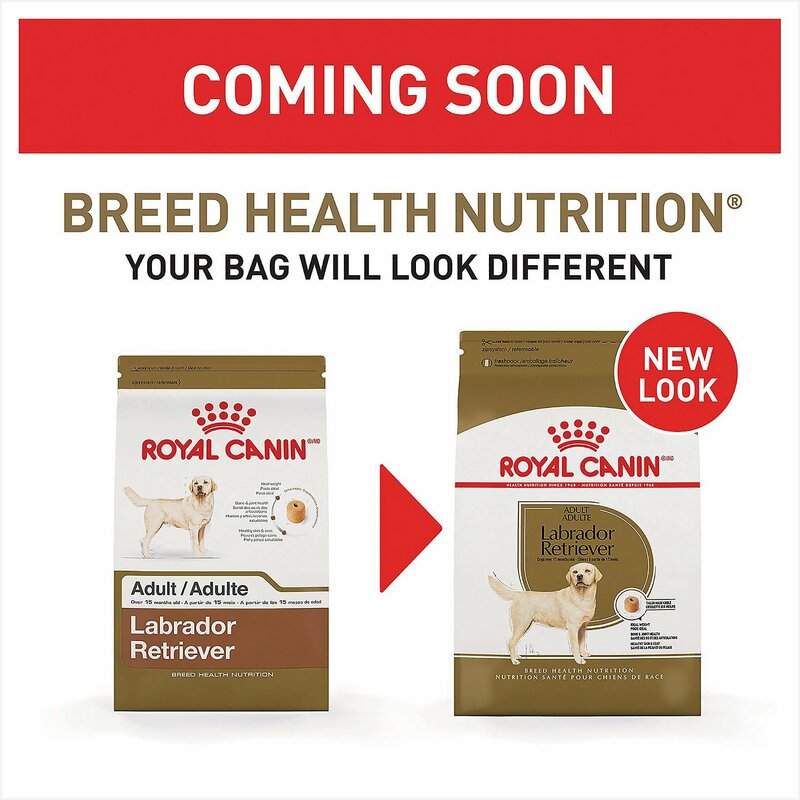 From the small, flat-faced Pug to the obesity-prone Labrador Retriever, Royal Canin Breed Health Nutrition is tailor-made to address the unique needs of pure breed dogs. 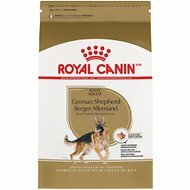 These breed specific formulas benefit from the latest Royal Canin research on the selection of the best protein sources, unique nutrients and tailor-made kibbles. Royal Canin's Labrador Retriever Adult Dry Dog Food is designed exclusively for pure breed Labrador Retrievers over 15 months. Ideal weight: Labrador Retrievers have a legendary appetite. As a result, they need a carefully controlled diet to avoid becoming overweight. This exclusive formula helps maintain an ideal weight with an appropriate calorie content. Bone & joint health: As determined athletes, Labrador Retrievers give their all. Their solid body, strong bones and natural predisposition to gain weight are some of the factors that can put stress on their joints. 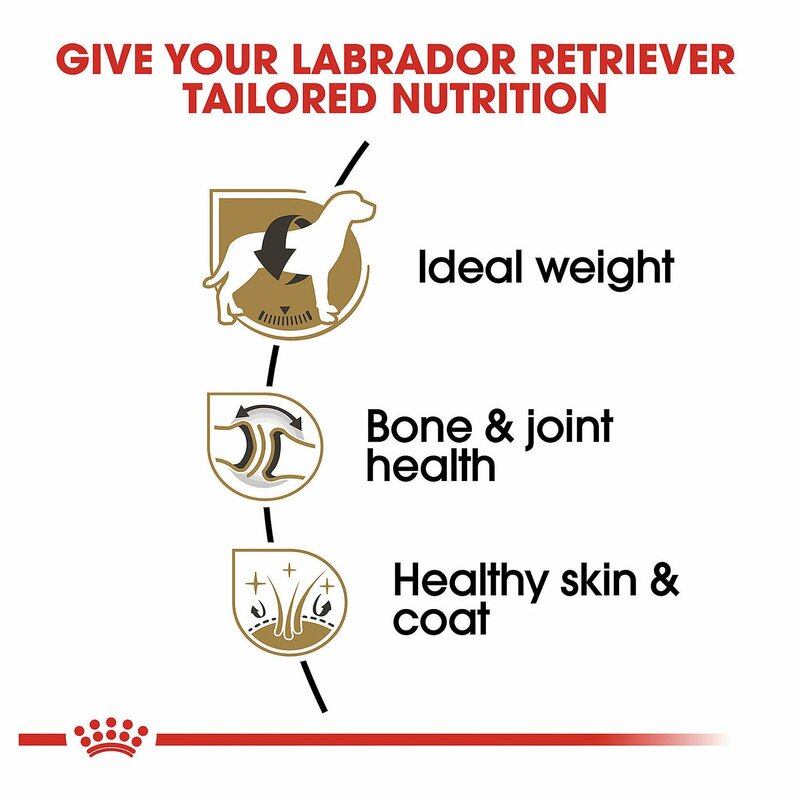 Labrador Retriever Adult Dry Dog Food helps support healthy bones and joints and maintain an ideal weight. Healthy skin & coat: Appropriate food plays an important part in maintaining the quality of the skin and coat. This formula helps support the skin's role as a barrier with an exclusive complex of nutrients, and helps maintain skin and coat health with EPA and DHA. Labrador Retrievers tend to eat quickly without chewing their food. 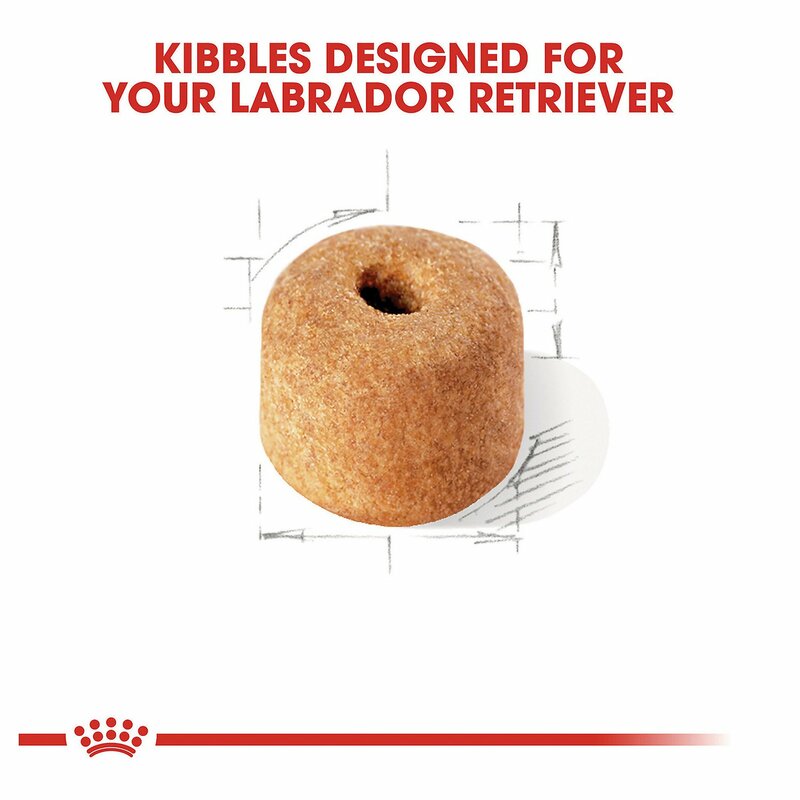 The donut-shaped kibble in Labrador Retriever Adult Dry Dog Food helps to slow the rate of ingestion and encourages dogs to chew. Over time, Royal Canin has accumulated vast knowledge about cats and dogs that only extensive research, scientific study and tireless talks with pet professionals, veterinarians and owners can provide. That knowledge led them to develop precise nutrition for cats and dogs. Each Royal Canin formula is tailored to pets' size, age, lifestyle and breed and contains more than 50 perfectly balanced nutrients for the most effective diet possible. Their focus on science puts pets at the heart of the formulation process, choosing only ingredients that optimize the food's nutritional content. Royal Canin also continues to invest heavily in new technology to ensure their quality and food safety systems remain state-of-the-art, so pets can continue to benefit from the latest in food health and nutrition. This dog food is so amazing that our 63 pound black lab literally stuck her head into the bag and was eating out of the dog food bag. The moment that it was at our front door she tore open the cardboard box and started sniffing around at the dog food bag immediately once I got it inside the house. I will totally buy this dog food again because our dog insanely loves it so much. The best thing is that the dog food is bigger so it kind of forces the dog to chew on it and not to swallow it whole. Our breeder was feeding our Lab Puppy Royal Canin, so I continued. After production problems (?) Chewy was unable to fulfill my order and I had to try and buy at local pet stores. I had to buy adult RC formula and decided to ween her off to avoid problems buying it in the future. And, it was brought to my attention that the first ingredient is chicken by-product. So...we are now feeding her Wellness Core. My lab loves this food. We have tried several different brands and this is her favorite. She is my first ever dog and I love that this is made especially for her breed. The only downfall is the availability of this brand in my town, therefore, I have it auto-shipped! This Dog food is great our puppy just graduated to adult dog food and he is a Lab/Border Collie mix but eats just like a lab gobbles and doesn't even chew. With this food the shape and size of it he has no choice but to chew its great. My two labs are somewhat stubborn with their kibble. I usually had to pour in broth or add in a mixer to get them to eat their kibble. As soon as the Chewy box came in my doggos were smelling it wanting what was inside! And that’s that one of my labs is terrified of cardboard boxes! I was not only impressed by the way this dog food smelled but how it looked as well. You could see the difference and I always see it when my doggos leave their bowls empty. Thanks Chewy.com! Our Labrador has been on the puppy food from the beginning due to our breeder's suggestion. We recently switched over since he is now an adult. At first, he was surprised by the bigger size of kibble - but it didn't take him long to adjust. It just takes him a little longer to eat since it's bigger. And, eating slower is not a bad thing! 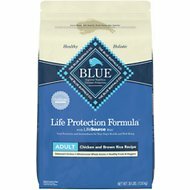 My dog liked the food right away and had no problems switching to this food. Seems to help with the problem labs have with swallowing everything whole and without chewing it up. She did chew up the individual pieces right away.